John gave up being a DJ to follow a career in record companies, and now has his own label Global Warming Records ( www.globalwarmingrecords.com). He also does consultancy work in music DVD productions. 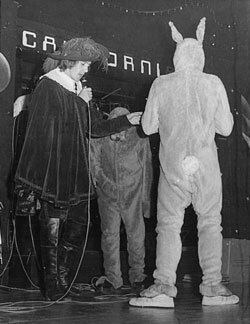 John says: "I have many fond memories of The Cali, and sadly have found the attached photo, which I sincerely hope is from a fancy dress night (either that or it is Dave Dee in full stage gear). After my family (I have 3 young daughters), my passions are my record label, and flying, which I do for both pleasure and business (and is also slightly less stressful than compering The Cali on a Friday or Saturday)."